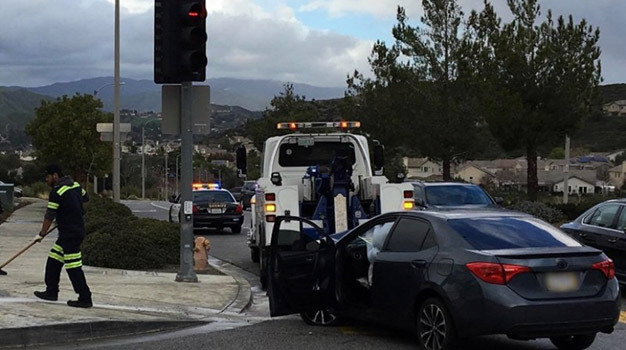 Santa Clarita, CA (February 4, 2019) – Santa Clarita Valley Sheriff station are investigating a collision between a motorist and a child who was walking to a nearby elementary school in Canyon Country Monday afternoon, February, 4th. According to a preliminary investigation, the incident occurred sometime around 3:00 P.M. just outside of Golden Oaks Community School on the corner of Golden Valley Road and Via Princessa in Santa Clarita. According to witnesses the victim was walking with other children near the school when they were struck by a dark-colored Toyota Sedan. The driver also collided with a traffic pole. It was unclear whether the injured child is a student at Golden Oak. The victim was Medevac airlifted to a nearby hospital suffering injuries that were not life-threatening, deputies said. Detectives are looking for the cause of the accident and why the driver lost control of his vehicle. Drugs and alcohol have been factored out and are not suspected of influencing the drivers handling of his vehicle. No identifying information was released on the victim or driver. Anyone with information can contact the Santa Clarita Valley Sheriff’s Station traffic investigators at 661-799-5111.